I totally missed the great Pop City article on my neighborhood, Highland Park (check it out). Yea, it’s really that rad here. Everyday when I walk Frankie I am constantly amazed by the incredible architecture and history of streets and houses. My neighborhood is totally urban, diverse, green, bike friendly, walkable, and just downright beautiful, plus the folks who live here are awesome – they really love coffee too. When I attended college at Pitt I rode by bike through Highland Park on my way to the Zoo to race in the Wednesday night bike races. I would say to myself every week – “someday I going to live here”. 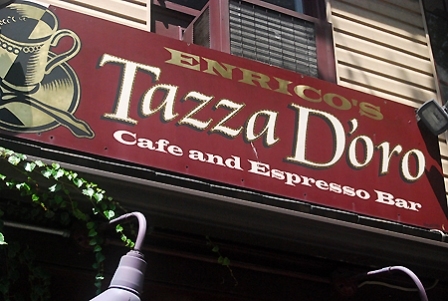 In fact, sometimes we would stop in Marcus Pharmacy to buy a can of soda before the race – Marcus Pharmacy is now Tazza D’Oro! A few months back Diana Nelson Jones of the Pittsburgh Post Gazette did an article about Highland Park receiving Historic Designation (article). Diana interviewed me for this article and while talking with her I realized the folks who live here are in true community with their neighborhood and neighbors. About 10 years after graduating from Pitt, I bought a house and then a building in Highland Park. Highland Park is where I live, brew coffee, play and watch the bike racers ride down Highland Ave on the way to the races.